Laetitia Sonami’s performance took place as part of Women in View, a festival featuring performance works by women artists and musicians. Sonami was one of three female electroacoustic composers on the bill, performing alongside Hildegard Westerkamp and Maggi Payne. Sonami’s 1996 performance unfolds in two parts, and demonstrates her engagement with sonic material and technology through the use of movement, found sound, spoken text and vocalization. The hand, already an expressive signifier, is further emphasized by the glove’s shaping of the acoustic environment. As Sonami states: “The intention in building the glove was to allow movement without spatial reference, and most importantly to allow for multiple, simultaneous controls.” The resulting sounds, determined through intuitive body movements and fluid responses, build a futuristic soundscape of disconnected information and cybernetic augmentation. Sonami, best known as a composer, performer, and sound installation artist, was born in France in 1957. She came to the United States in 1975 to further her interests in the then nascent field of electronic music, later studying with such innovators as Eliana Radigue, Joel Chadabe, and Robert Ashley. Sonami now lives in Oakland, California where she is a guest lecturer at the San Francisco Art Institute and the Milton Avery MFA program at Bard College. 1 – Front Magazine, vol. VII, no. 3, January/February 1996, 10-11. 3 – Sonami, Laetitia. “Instruments | Lady’s Glove.” LAETITIA SONAMI. Accessed April 2018. http://sonami.net/ladys-glove/. 5 – Hayford, Justin. “The Sound of the Hand.” Chicago Reader, October 19, 1995, 25th ed. Accessed April 2018. https://www.chicagoreader.com/chicago/the-sound-of-one-hand/Content?oid=888790. 8 – Sonami, Laetitia. “Bio | Laetitia Sonami.” LAETITIA SONAMI. Accessed April 2018. http://sonami.net/bio/. Reading and sonic performance by the artist using the Lady’s Glove as instrument and prop. An evening of interactive work, tape, and video by three accomplished women composers in the electroacoustic field of music. 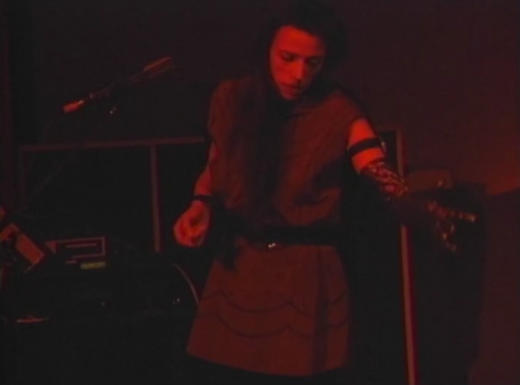 French born, Oakland-based Laetita Sonami has been an artist-in-residence at STEIM, Amsterdam, for the past three years, building a new version of the Lady’s Glove – a cyber instrument which allows Sonami to modify sound by gesture. She received an MFA in 1980 from Mills College, where she studied with Robert Ashley and David Behrman. “A striking talent. Expect something inexplicable, compelling and deeply personal,” says Village Voice.